Gregg Squeglia is a physical therapist based on Cape Cod, Mass. He specializes in orthopedic and work related injuries and has written articles for “Fire Engineering” as well as numerous ghostwritten articles on these topics. He holds a Bachelor of Science in physical therapy from the University of New England. Do not let the phrase "traditional archery" fool you. Modern longbows and recurves are precision-engineered pieces of equipment, and in the hands of a skilled archer, they provide the precision and accuracy needed for competition or hunting. The shoot-around arrow rest, also known as a flipper, is on the riser just above the handle grip and provides consistent arrow placement with each arrow load, allowing the archer to achieve greater accuracy. Arrow rests do wear out over time, and knowing how to properly install them will help keep your arrows on target, shot after shot. Ensure that the area where the arrow rest will be attached is free of dirt, debris or old adhesive from the arrow rest you are replacing. Clean the area with rubbing alcohol or a commercial cleaner designed to remove adhesive residue. Peel away the self-adhesive backing on the arrow rest. If your bow has a plunger recess, center the hole in the arrow rest over the plunger hole in the bow. If your bow does not have a plunger hole, line up the arrow rest vertically with the bow handle directly above the web space of your hand as it grasps the handle. Leave 5/8 inch between the arrow and the bottom of the sight window, which is the horizontal part of the bow just above the handle. Once aligned, attach the arrow rest to the bow using firm pressure. Install a nocking point on the string. This is a small, U-shaped metal piece that clamps on with pliers. The nocking point ensures a consistent placement of the arrow on the string. To do this, place a bow square lightly on the installed arrow rest and up against the bow string. Mark 5 millimeters above square and place a nocking point. The arrow -- when placed on the bow string -- will rest on top of this point. Shoot some arrows to test your setup. If you see vertical movement, or porpoising, of your arrows when you shoot them, adjust your nocking point on the string. Do not try to move the arrow rest to fine-tune your bow. If your arrow is rotating upward, raise the nocking point 1 to 2 millimeters. Adjust as necessary until aberrant motion is eliminated. Shoot-around style arrow rests are right-handed or left-handed. Buy an arrow rest that is compatible with your hand dominance. 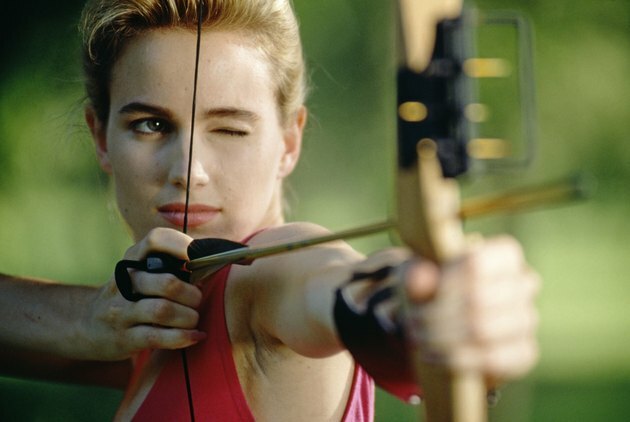 As with any shooting sport, archery requires constant attention to safety. Ensure that any people or non-game animals are safely behind you when you shoot an arrow.